One of the reasons why I love my work is because I love words and language. In today's picture book children will encounter a delicious collection of words and wonderful rhymes, which are presented in a clever alphabet book type format. Alphabet books are more varied today than they have ever been. Some are straightforward ABC books that use pictures and single words to help children to learn their alphabet. Others are packed with information about a variety of subjects. 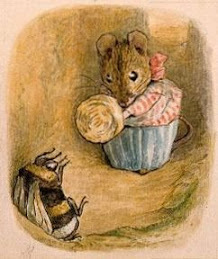 In this unique title the author and illustrator have chosen to entertain their audience while they show them that there is a wonderful world of words out there. For every letter of the alphabet Steve Martin has created a funny nonsense rhyming couplet in which he introduces some characters who are doing things that are amusing, downright outrageous, or deliciously naughty. In each line of verse Martin uses plenty of words beginning with the letter of the alphabet that is features on that page. On the H page for example we meet Henrietta the hare who "wore a habit in heaven" and who had a "hairdo" which "hid hunchbacks: one hundred and seven." Readers will laugh at loud when they read the descriptive couplets, and they will also discover that the accompanying illustrations are packed with things whose names begin with the letter being featured. Thus, on the L page we not only read that Lovely Lorraine is discovering that long Louie has Larry's locket, but in the artwork we see, among other things, a lamppost, a boy licking a lollipop, a loudhailer, and a lawyer. As they turn the pages, children will have a wonderful time reading the rhymes out loud and searching the illustrations for hidden objects and words. These days the news is full of stories that seem to indicate that in some places the divide between people of different cultural backgrounds is getting wider and wider. Too many of us are getting less tolerant and accepting of people who not like us. I find this trend to be both disturbing and very discouraging. One way to counter this trend is to help our children to understand and appreciate people who are culturally different from them. Books that celebrate diversity can help parents, teachers, and librarians to explore how our lives are made richer when our communities are heterogeneous. Today is Multicultural Children's Book Day and below you will find out why this event was created by two women who want to open hearts and minds one book at a time. Visit the Multicultural Children's Book Day website to find out more. Children’s reading and play advocates Valarie Budayr from Jump Into a Book and Mia Wenjen from Pragmatic Mom have teamed up to create an ambitious (and much needed) national event. 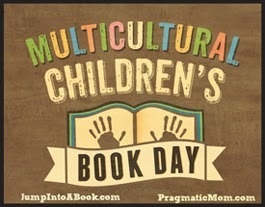 On January 27th, Jump into a Book and Pragmatic Mom will be presenting yet another Multicultural Children’s Book Day as a way of celebrating diversity in children’s books. Together the MCCBD team hopes to spread the word and raise awareness about the importance of diversity in children’s literature. Our young readers need to see themselves within the pages of a book and experience other cultures, languages, traditions and religions within the pages of a book. We encourage readers, parents, teachers, caregivers and librarians to follow along the fun book reviews, author visits, event details, multicultural children’s book linky and via our hashtag (#ReadYourWorld) on Twitter and other social media. Picture Book Monday with a review of Uh-Oh, Dodo! Some people like to think that it is easy being a small child, but there are so many mistakes that one can make when one is very young and inexperienced. In today's picture book you will meet a young dodo bird who is constantly putting his rather large feet into it, and we cannot help laughing at the mistakes he makes. Dodo is a little dodo bird who has very large yellow feet, a little feather dusterish white tail and a large beak. Today he and his Mama are going for a walk. Dodo’s feet, like the feet of many little birds, have a mind of their own. Dodo is so taken with how talented his toes are that he forgets to pay attention to what he is doing and he walks straight into his mother’s backside. Dodo sings loudly for everyone to enjoy, only not everyone is pleased by the noise he is making. A mama bird who has chicks in her nest angrily shushes him. Next, Dodo decides to start a “funny-shaped rock collection.” He collects all kinds of rock like objects, including a knobbly green rock. Dodo soon discovers that the rock is not a rock at all. It is a tortoise who is not really interested in being part of any collection. Just like so many little children, poor Dodo goes from one uh-oh moment to another as he follows his mother. Everything he does is well intentioned, but somehow things go wrong and Dodo ends up in some kind of pickle. Young children are going to love the uh-ohs in this book, many of which are sweetly funny. They will easily connect with the little bird who tries to play with the wrong animal, hugs the wrong legs, and eventually wears himself out completely. Sharing stories with children is something many grownups do by reading aloud in libraries, classrooms, and at home. Doing this not only entertains children, but it also helps them to discover that the written word is a powerful thing. Today I have a review of a book packed full of poems that are perfect for reading aloud. Babies, even before they come into the world, are attuned to rhythmic sounds. They hear the beat of their mother’s heart before they are born, and can also hear the rising and falling sound of her voice. They therefore come into the world with a natural inclination to listen to sounds. Rhythmic sounds such as the purr of a car engine and the rumble of a dryer send them to sleep, and bedtime lullabies make them feel loved and safe. Since songs are “nothing more than poetry set to music,” children have an affinity for poems and they enjoy having poems read to them, especially ones that have a lilting rhyme. In this collection of two hundred short poems grownups will find verses that were written especially for little children. The poets have taken the short attention span of their audience into account, and they use language that will resonate with their young listeners. Some of the poems tell little stories that will amuse children, others describe activities that children enjoy doing, things such as jumping, playing hide and seek, blowing bubbles, playing in that mud, and having a bath. There are also poems that describe animals, places and things that children encounter as they go about their day. So often things seen through the eyes of a wondering child gain a depth and a significance that adults no longer know how to find. Many of these poems capture that wonder, and celebrate the marvelous in everyday things and situations. For example in Home, a child describes how he or she collects shells and then goes home. There are only four lines in the poem and yet the scene and the child’s pleasure comes through loud and clear. Throughout this splendid book, Marc Brown’s storytelling illustrations and sweet artwork vignettes are paired with the poems. I really like my alone time. In fact, I need some alone time every day, otherwise I start to feel squirrely. In today's picture book you will meet a bear who is trying to have a little time alone, a little time when he can be quiet and calm. The problem is that his friend Goose does not really understand why Bear needs this. Fox says that he likes quiet time too, but it turns out that Fox’s quiet time is nothing like Bear’s quiet time. Fox hums, twirls, and whooses “like the wind,” and poor Bear is not at all happy. He just wants some quiet. Some real quiet. Some people need quiet time on their own. They are not upset about anything, they just need some space to enjoy being with themselves. The problem is that other people don’t always understand why they need this time, and they don’t understand what quiet time means. In this sweet picture book Suzanne Bloom’s expressive and minimal illustrations are paired with a spare text to give young readers a story that explores how three very different characters find a way to be alone, and quiet, together. Many children like to watch animals in zoos and on television. They like to read about real animals in books, and many picture book authors and illustrators use animals as their main characters because they know that their young readers are will be drawn to their creations. Poets too like to write about animals, and today's title is literally packed with animal poems of all kinds. Many poets love to describe nature and animals in the poems that they write. Some like to go a step further and they “try to imagine the secret lives of animals.” What is it like to be an animal, and to see its world through the eyes of that creature? In this remarkable collection of two hundred poems we encounter animals that have just come into the world, those that are big, those that are small, the winged ones, the ones that live in water, the strange ones, the noisy ones and the quiet ones. Some of the poems were written many decades ago and capture the feeling of a different time. Others are more modern and reflect a more contemporary approach to poetry writing. There are poems that rhyme and those that are written in blank verse. Some are funny and others are more completive. Some of the animals are strangely creepy, like the piranha who will consider “you’re meat” should you ever encounter it. Others are weird but funny, like the baby porcupine who, though it cannot yet climb trees can still raise its quills “and pirouette.” Then there is the armadillo which “From head to tail / It wears a scratchy coat of mail.” Meerkats, anteaters, frilled lizards, sting rays and other oddities also appear on the pages. Throughout the book the poems are paired with stunning full-color photographs to give readers an extraordinary journey into the world of animals. The photos provide a wonderful backdrop for poems written by Jane Yolen, Robert Louis Stevenson, Robert Frost, Hilaire Belloc, Michael J. Rosen, Ogden Nash and others. Today's picture book is one of the funniest books I have read in a while. I literally laughed out loud as the story unfolded. The characters in the story are so delightful, and readers will find it impossible not to feel sorry for them AND laugh at them at the same time. One day a man who is transporting some big yellow cheeses in a cart stops to take a rest. While he is having a picnic meal with his little boy one of the cheeses rolls out of the cart and rolls down the hill. The little boy chases the cheese, but it is going so fast that he can’t catch it. Then the cheese flies off a cliff and is gone. Down in the valley Mr. Squirrel is woken up when the moon (the wayward cheese) lands on the branch right outside his front door. Mr. Squirrel has no idea why the moon has left its place in the sky. Perhaps someone stole it and then lost it. Perhaps people will think he stole it, and then he will “be arrested and thrown into prison.” The idea is too terrible to contemplate. There is only one thing Mr. Squirrel can do. He has to get rid of the moon as quickly as possible. Using every ounce of strength he has, Mr. Squirrel pushes the moon off the branch ... and it lands on Mrs. Hedgehog, where it gets very very stuck. Now both Mr. Squirrel and Mrs. Hedgehog are both going to get arrested for stealing the moon. This is a disaster! Readers of all ages are going to love this deliciously funny picture book. One cannot help sympathizing with Mr. Squirrel, but at the same time it is hard not to laugh at the mess he and his animal friends get into. As the story unfolds the situation gets worse and worse, and funnier and funnier. It is hard to be know how things are going to turn out. When I was in university in England, two events had a big impact on all of us students. We watched the Berlin wall come down, and we saw Nelson Mandela being released from prison. Many of us demonstrated outside the South African embassy in London (including me) calling out for the the South African government to release all political prisoners. All of us grew up in the shadow of the Cold War and it was extraordinary to see the wall come down, knowing that this was the beginning of a new era. For many young people growing up in the United States during the 50's and 60's, the events associated with the civil rights movement changed their lives. Today's poetry title tells the story of the March on Washington through the eyes of these young people. Many of us live in places where people of different races, religions, and cultural backgrounds live together. We embrace the fact that our streets, restaurants, schools, offices, and other places are full of people who are from different racial and ethnic backgrounds. We recognize that diversity makes our towns and cities richer. This was not always the case. For decades most of the south and some places in the northern parts of the United States were strictly segregated. African Americans could not use the same schools and other public places that white people used. They could not go to swimming pools, could not eat in restaurants, and had to sit at the back in buses. They were second class citizens. Then a movement, put into motion by Martin Luther King Jr. and his followers, began to bring about change. In 1955 Rosa Parks refused to give up her seat on a bus, and the Montgomery Bus Boycott began. By 1963 the civil rights movement had begun to unravel the Jim Crow laws, and on Wednesday August 28 of that year thousands of people gathered on the Mall in Washington, D.C. for the March on Washington. What would it have been like to be a part of this historic event? What would it have been like to organize it? In this remarkable book of poetry we meet some people who went to the march, who worked hard to make it a success. Some of people we encounter are fictional, while others were really present on that day. One of the first people we meet is Myrtle Hill, a school teacher, who experiences fear when stones are thrown at the bus she is travelling in from Baltimore, Maryland, to Washington, D.C. A window is broken and passengers scream. People dive for the floor of the bus, and then one of the women starts to sing. Soon more voices join hers and thus the people throw songs at the people who threw rocks. Soon after, we meet Annie Ross, a nineteen year old college student from Georgia who went to Washington. Sixteen year old Dan Cantrell is also from Georgia, and he goes to the march even though his father tells him not to. Raymond Jarvis also comes from the south. He is from Texas and has suffered at the hands of white supremacists. Ruby May Hollingsworth is only six years old, but she and her family travel all the way from Arkansas. Ruby does not really understand what is going on, but when she is allowed to drink from the same water fountain as a white girl she begins to realize that something important is happening around her. Emma Wallace travels all the way from a farm in Iowa. She wants to be a part of history, to see what is happening in her country for herself. She is encouraged by her father to see the “national powwow” and perhaps witness the event that will “shame the past / and shape the future.” Renee Newsome, who lives in Washington D.C also has a father who encourages her to be a part of the march, and she goes to the Mall with him and her grandmother. The stories of these six characters are told in a series of poems, and we are able to see what being on the march meant to them all, how it changed their lives in meaningful ways. We also hear the voices of other people, people like the singer Lena Horne, Coretta Scott King and Charlie Jackson, who was a policeman. The voices that speak to us from the pages of this book bring the March on Washington to life, helping us to experience this extraordinary time in a personal and powerful way. We come to understand why this event meant so much to so many, and we give thanks that its impact is still being felt today. These days many children grow up in in blended families. Often, in the beginning, many of the adults and children find the new situation confusing or complicated. In today's picture book we meet a blended family that it very unusual indeed and we see how the children in the families concerned figure out how to solve their problems. Before all the trouble started they were an ordinary bandit family. The many children (seven in number) played and roughhoused, Dad read the paper, and Mom counted their loot. Then, for some reason, Mom and Dad began to argue. Pots and pans flew through the air, voices were raised, and the children looked on with wide eyes. Dad moved out and the children missed him because now their “life was only half the fun.” The children decided that something needed to be done, so they packed up some bags and went to visit their father. From that day onwards the children moved back and forth between the houses of their parents. Then one day they got to Dad’s house only to discover that a princess and her children were in residence. The interlopers were “prim and prissy” and none of the bandit children like them. There was nothing they could do about the situation though because the princess was there to stay. Now the bandit children had two families to live with. Having two Christmases and two birthdays was great, but they did not like the fact that they never had their father to themselves. Sometimes Mom was unhappy, or Dad was unhappy, or the princess was unhappy. The little bandits decided that the only thing to do was to get rid of the princess and her offspring. They thought that that doing this would solve all their problems, but it didn’t. Families come in all kinds of shapes and sizes, and when families blend there is often a settling-in period that no one enjoys. No one knows quite what to expect, tempers gets frayed, feelings get hurt, and often many of the family members wish they could turn back the clock. Figuring out how to make things work takes time, creativity, and lots of patience. This sweetly funny picture book explores how several families come to terms with change, and how the young members of these families learn that love is limitless. There is always plenty to go around. I can still remember the first concrete poem that I read. It was Mouse's Tail, by Lewis Carroll, which appears in his book Alice's Adventures in Wonderland. I thought the poem was very clever and showed it to my father. Nowadays lots of poets are trying out this clever poetry form and it is interesting to see what they are creating. Most of the time poems are written so that words are in horizontal lines that go across the page from left to right. We are used to this format and comfortable with it, but some people like to write poems that are a little different. They write concrete poems, which are poems that look like the thing (or things) that the poem is about. The letters of the poem “are arranged on the page to form a picture” of that thing. Thus a poem about a pair of scissors might be arranged on the page so that the words in the poem form the picture of a pair of scissors. Concrete poems are fun to create and they don’t have to rhyme, so they are a wonderful poetic form for novice poets to try. Wonderful touches of humor, amusing artwork, and a delicious moments of word play make this book of poetry a must for young readers who appreciate poetry in all its forms.